Tuckshop Gardener: Flowers mustered, stall done and dusted. Managed to wrangle enough plant material from the garden to populate my first stall of the season - a big relief. Lots of planted teacups as well as ones with flowers arranged in them, a few cut off wine bottles with larger arrangements, willow wreaths and, of course, lots of magnolia. Had lots of people cooing over the stall and found that there are plenty of other chinaholics lurking in the woodwork...none male, as my husband points out. It was also funny to tab-hang on people's discussions about the stall as they walked by and I think it jumped out at them because it was so different to standard florist fare. Lots of comments on the idea of teacups and china, and a lot of interest in the magnolia - have to say I was almost pleased to see the back of it, as I've spent the last three weeks changing the water in the buckets and lugging them in and out of the house to get them colder/warmer to stop/start them flowering as needed. I seem to spend all day picking up the fuzzy casings the buds shed, or rescuing them from the cats who delight in pinging them around the wooden floors. The 4.30 wake up to get everything arranged and packed up for 8.00 am was a bit of a shocker and I'm quite knackered now, but it is good to get the first stall out of the way and I'll have a better idea of how to organise myself more effectively next time around. Also got nobbled by a lady who is running a craft fair next weekend who wants me to take a stall. As the garden is really starting to go into lift off now, I think that another week should see me right in terms of plants - the tulips are colouring up, bluebells are starting to form their flower spikes and the honesty is almost ready to flower as well. I'll just have to continue my daily march around the garden shouting at it all to grow! The bonus of doing a flower stall is that the house looks gorgeous with the leftover plants - saves me having to organise myself to make more! Your mantelpiece looks great with the leftover plants. I keep giving them away to all visiting parents who come to collect their offspring. They'll be timing their play dates strategically once they work it out! That first photo of the tea cup and flowers is really very lovely. Thanks for your good wishes - this blogging mularkey is really nice in generating a support network! Your arrangements look very elegant - and it looks like you had a sunny day on the stall? 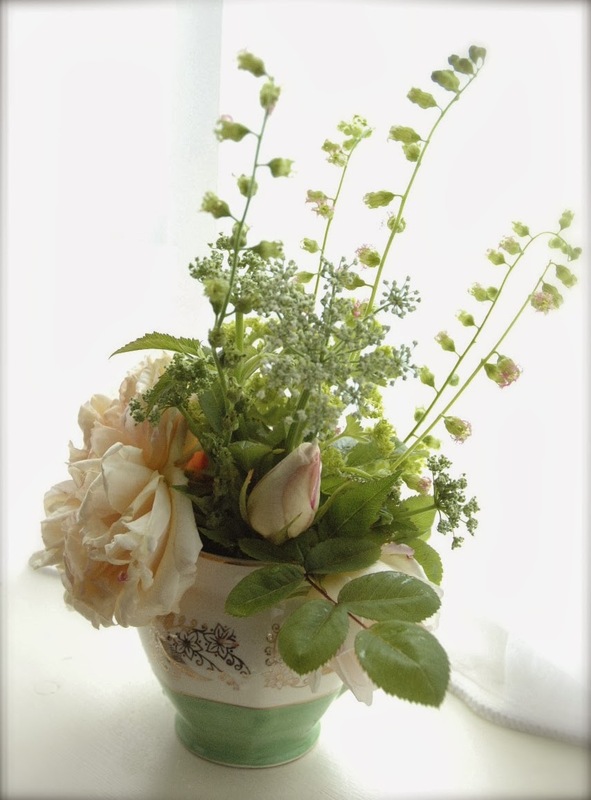 Only the other day I made a small tea cup and saucer arrangement using some dried flowers from a basket bouquet I was sent last month. I was quite impressed with the result! The hellebores look great in that tea cup shot. Sunny indeed - a very positive start to my year of stall holding. Thanks for your feedback on my teacups - I think I am barking up the right tree after all. The helllebore and hyacinth cup was my favourite one. Surprised it didn't get snapped up but was quite happy to give it a home on my hallway table! Aah - thanks. Even had some magnolia left over and took it round to a friend's for coffee this morning. So nice to be able to give a bunch of flowers again!